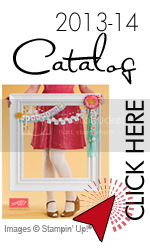 I have been having a great time playing with all the new products that Stampin'Up has in the new catalog just released on July 1st. A few of the products were made available to the demonstrators for purchase prior to July. 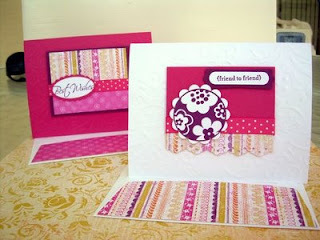 We were able to purchase the new In Colors and a Designer Series paper called Razzleberry Lemonade. 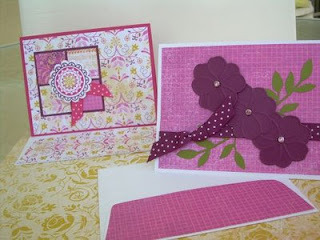 The combinations of colors in the paper gives you endless possibilities of card combos. The four above used, melon mambo and rich razzleberry. They sure can cheer you up on a raining afternoon.